Xstacy always makes me laugh, that’s a very funny comment (as usual). I wanted to work in the phrase “givin’ them the ol’ Wun Too” also, but the post would have been too long…. Exiting Comics delivers once again!!! 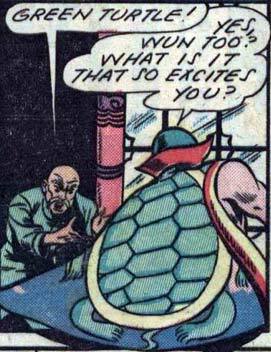 (What Won Too is excited about if that Green turtle only wears a cape and cowl….) EXCITEMENT, indeed..
Actually I screwed up, this was in “Blazing Comics” number 3, from 1944. Oops! It IS very exciting, though. The Green Turtle is BLAZING HOT!! !